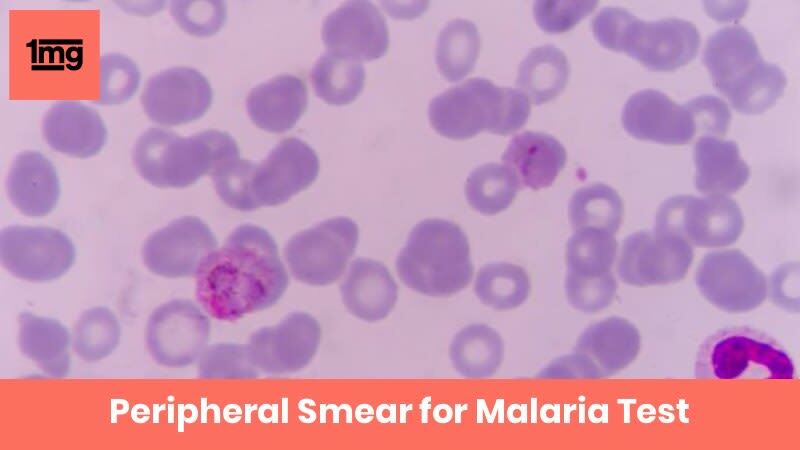 What is Peripheral Smear for Malaria? Peripheral smear for malaria is done to detect the presence of malarial parasite in the blood. Malaria is an infectious disease which is caused by species of the Plasmodium parasite. It is caused by the bite of the infected mosquito (female anopheles). The species which cause infection in humans include Plasmodium Vivax, Plasmodium malariae, Plasmodium ovale and Plasmodium falciparum. Why is Peripheral Smear for Malaria done? What does Peripheral Smear for Malaria Measure? Peripheral smear for Malaria is done to detect the presence of the malarial parasite in the blood. It is also used to monitor the treatment of malaria. Once the treatment of malaria is started, the doctor may advise re-test to monitor the treatment. A drop of blood is spread thinly on the glass slide and then studied under a microscope to examine the blood cells. The diagnosis is made by spotting out the parasite of malaria or its antigens or its products in the smear. Thick smears help to detect the presence of parasite while thin smears help to detect the type of species of parasite. Thin smears help in evaluating the presence of schizonts (stage of the malarial parasite with the presence of many small nuclei), gametocytes (stage of malarial parasite where it can produce more gametes) and presence of any pigmentation due to the malarial parasite in the blood. Positive results indicate the presence of the malarial parasite in peripheral blood examination. Negative results indicate that no malarial parasite is seen on peripheral blood examination. Malaria is an infectious disease. Malaria is caused by species called Plasmodium. These parasites spread via the bite of female anopheles mosquito. The species of Plasmodium that infect the humans include Plasmodium vivax, Plasmodium ovale, Plasmodium malariae and Plasmodium falciparum. Q. How does the malaria spread in the body? Malaria spreads through the bite of female anopheles mosquito. When the female anopheles mosquito bites the humans, the parasites of malaria get transferred into the human body and reach the liver. After the infection, the parasite takes a week to a month to enter the red blood cells (RBCs) in humans. They multiply in the RBCs within 2-3 days and produce symptoms of malaria. Q. Do negative results mean that malaria is not there? No, negative results might be due to the reason that the malarial parasite was not present in the prepared peripheral blood film. Your doctor may advise you a re-test if the symptoms of malaria persist. Q. What are the symptoms of Malaria? Symptoms of Malaria include chills, high fever, heavy sweating, nausea, vomiting, headache, pain in the abdomen, diarrhea, pain in muscles. Q. Can Malaria occur only through the bite of female anopheles mosquito? No, Malaria can also occur after an organ transplant, by sharing needles or syringes or after blood transfusion.